Ron Filion knows as well as anyone that a youth hockey program is only as good as the coaches running it. Perhaps even more important, though, he understands that hours put in behind the scenes developing a plan are often as important as those spent on the ice. The keys, he said, are the coaches and the legwork put into establishing a solid game plan to develop young hockey player. Filion and Mike Hensdell oversee all skill development and skating, working with the Bobcats Tier I teams once a week and the travel teams 2-3 times a week. From there, the program has broken down its approach into a level-by-level plan that addresses the specific needs of each age group. At the Mite level, Filion, Hensdell and James Goon work on basic skills and skating progression to ensure that all players are ready to play squirts. Once they’ve moved to Squirts, Matt Eltman joins Filion and Hensdell to continue with skill development and slowly move into the structure of the game, working on 1-on-1 situations, 2-on-2s, 3-on-2s and more. Game structure is brought into the curriculum at the Pee Wee level, with a shift in focus to understanding of strategies. Things get more serious in the Bobcats program when players reach Bantam age. The program makes a strong distinction between 13U and 14U players, creating a specific focus for each in order to prepare them for their season ahead. The 13U players – who at previous levels have not employed body checking as part of their game – are taught the proper techniques for hitting. Coaches also work closely with them on understanding more advanced game systems, which should help them prepare for their first draft year as second-year Bantams. On the 14U teams, Filion works with Jason Oliver to refine skills, skating, game knowledge, off-ice training habits and more, so that players start to become polished and can really focus on showcasing their skills in games. The coaches spend countless hours determining the best tournaments to attend to achieve the proper exposure for their players, as well as plenty of hours on the phone singing their players’ praises to Western Hockey League scouts. Pat Conacher and Connor Long head up the 16U American team. They focus on giving their players a final touch of skill and game knowledge training to prepare players for junior camp and their second year of 16U play. The 16U National team is headed by Pat Mahan – who has been with the Bobcats since Day 1 – and Brent Gough, and the emphasis is on showcasing players for the United States Hockey League, North American Hockey League, British Columbia Hockey League and Western Hockey League junior scouts during their NAPHL season. The 18U level had been neglected for a few years, which is why Filion wanted to bring in Gough, a former BCHL coach, to make it a priority. 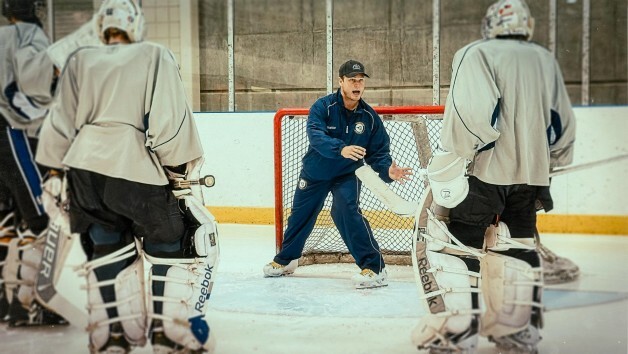 With his many connections in junior hockey, Gough is the perfect coach to help players fine-tune the skills they need to play junior hockey and get seen by the right people.